Usually when I take a blogging break it’s relatively short, but May was different. It was a full and busy month as we prepared for and celebrated two graduations (plus a multitude of other events) and shared many wonderful moments together as family. I am so grateful to have the opportunity to step back from my business when the occasion arises, and those of you who are parents of adult children can particularly relate to my delight in having all three of my children home together at once! I hope you’ll indulge me a bit as I share a few special moments. 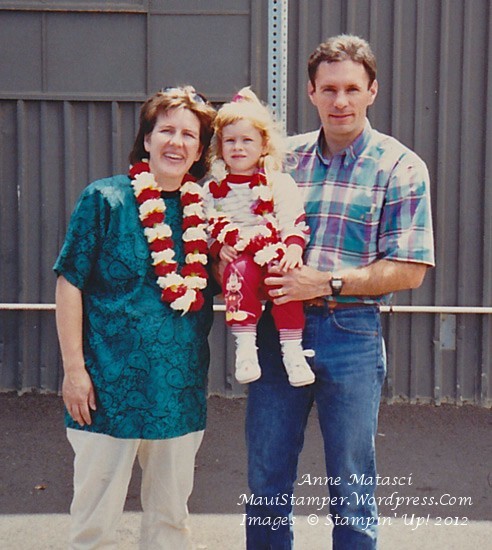 If you’re not familiar with my family, the first thing you need to realize is that my husband and I moved to Maui from California in 1990 for a two-year assignment. That’s us, exhausted from the flight and a little dazed by what we’ve done – and yes, I am 7 months pregnant! 22 years later, we are still here and loving it. We raised three beautiful children here, have made many dear friends, and have deep roots in this community. However, both of our families are primarily on the West coast, so we don’t often have the chance for large family gatherings. In a bittersweet echo, my children have each embarked on distant adventures of their own. Our oldest daughter is now living and working in Perth, Australia. Our second daughter just graduated from college in Boston, Massachusetts, which is about as far opposite Perth as you can get! My daughters like to say that I raised two confident, strong women and that’s why they are living so far from home. My son just graduated from high school, and in the fall he’ll enroll at the University of Notre Dame in South Bend, Indiana. I wish I could find a way to complain about that, but our oldest daughter graduated from Notre Dame and my husband and I are confident that it’s the perfect place for our son. The good news is that we will become empty nesters and will have more flexibility in our travel schedule so that we can visit our children in these far-flung places! We were together in Boston for graduation although it was a very quick trip – flying from Maui to Boston and back in 5 days isn’t ideal, but it’s what we needed to do! The weather was beautiful, the sight-seeing and restaurants were fabulous, and graduation was everything a graduation ceremony should be – including loads of photos. We all returned to Maui for my son’s graduation and were joined by my parents and my son’s godparents. My son’s graduating class was small – only 25 students – and they are very close, so you can imagine what a wonderful evening it was for everyone who attended. He received a number of awards including being the class Valedictorian, and we were all tremendously proud. My daughters were able to stay here on Maui with us: one for a week, one for almost two, and I can’t begin to tell you how fabulous it was to wake up in the morning and know they were all under my roof. The girls are now back in Perth and Boston, and my son has started work for the summer, so I’m doing my best to return to routine. Captain Stupidhead (who had dental surgery in May, but that’s a story for another day) seems to think that I should give him as much attention as the three children combined, but he is sadly mistaken. I’m stamping like mad and have loads of things to share – but this is enough for one day. I’ll share projects tomorrow, I promise. How did it take me so long to love something called MOCHA?? Thank you Ms Cookie – it was a wonderful time with the family but I am delighted to be back to stamping! What a lovely family you have and is it a wonder your two girls have moved so far from home look what you and your husband did 22 years ago! Congrats on the double graduation and good luck to your son. What a beautiful family! Thanks for sharing a little history. I’m pretty glad you & Ray decided to stay on Maui.